A Kiss Is Just A Kiss—Or Is It? Can you tell us a little bit about yourself and how you came to Toronto? My name is Salma. I moved from Syria to Canada in the late 90s with my family. Since then, I have lived and worked in Toronto. I am a trained herbalist and I am currently completing my certification as an interpreter. Through my interest in social justice, I have been working as an interpreter with different organizations supporting Syrian women and Syria youth refugees. When you and I first met, you told me that you have family in Homs and Aleppo. I found myself struggling for a way to adequately express any useful response. What is it like for you when you share your experience as a Syrian-Canadian to people who have never experienced life in a conflict zone? Each time I share my experience, it’s very different and it really depends on who I am talking to. I have not lived in Syria since I left, so while I do not have the experience of living under the current violence, I am affected by it because I have family who are still living there and because I am well aware of the impact this war is having on my homeland, community and culture. Do you think “western” or non-Syrian artists have a role to play in raising awareness of the current conflict in Syria? And what do you think that role is? I think that is a very loaded question. At the moment, I don’t think there is anyone who does not have some idea that there is a war or violence in Syria. The history, and nuances of what is taking place is what I find to be the missing piece. What I wish is that Syrian voices are the ones amplified and included in these conversations. However, there are issues here in Canada that artists here can discuss and engage in. For example, I think artists can use their voices to ask Canadian government for more and better resources for Syrian refugees, they can ask Canadian government to be transparent about its involvement in selling weapons to the Middle East, and they can use the stage to fight the raising racism and Islamophobia in Canadian society. How do you feel when you see artists or performers telling a fictitious story about Syria? Is it possible for art to create real empathy and understanding between different cultures? I believe that art has the power to connect human experiences — that is what empathy is. For example, when I listen to Opera, even if I do not understand the words, I can connect with the emotions. When you listen to Arab music, even if you do not speak Arabic, you can connect with the emotions. The “understanding” part for me it is not necessary, and I am not even sure it is possible or desirable. Because as people we cannot always understand the situation someone is in, but we can connect emotionally. What I think is important in art is its capacity to open up conversations, and allow those connections between people. You did the English-to-Arabic translation for KISS, and you coached Bahareh Yaraghi and Liza Balkan in their Arabic – neither of whom speak Arabic at all. What were the challenges? I loved working with Bahareh and Liza, and I was really impressed by how seriously they took the task, and how they wanted to rise to this challenge. In terms of challenges, they were mostly linguistic — as in, how do you describe certain letters or sounds that they are not necessarily used to hearing, or saying? What does this production of KISS mean to you? Working within theatre has been a very interesting experience to me, as I have never been part of a big professional production before. 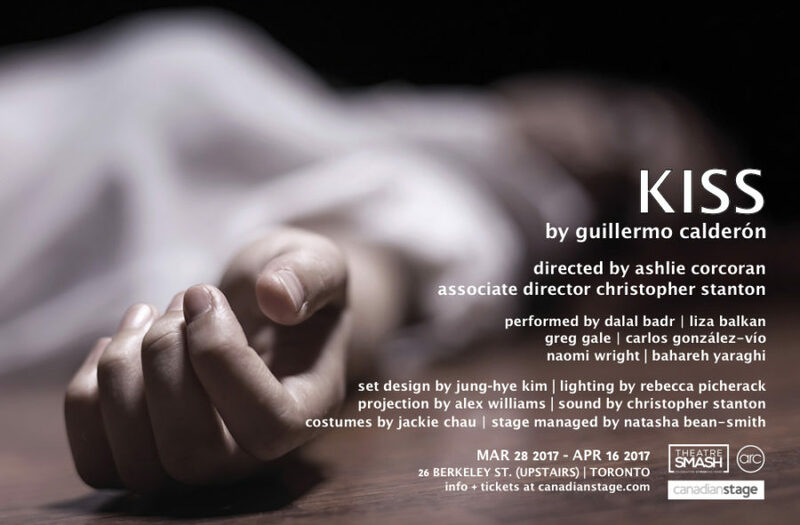 I am looking forward to seeing the play on stage — and seeing the impact it has on the audience. 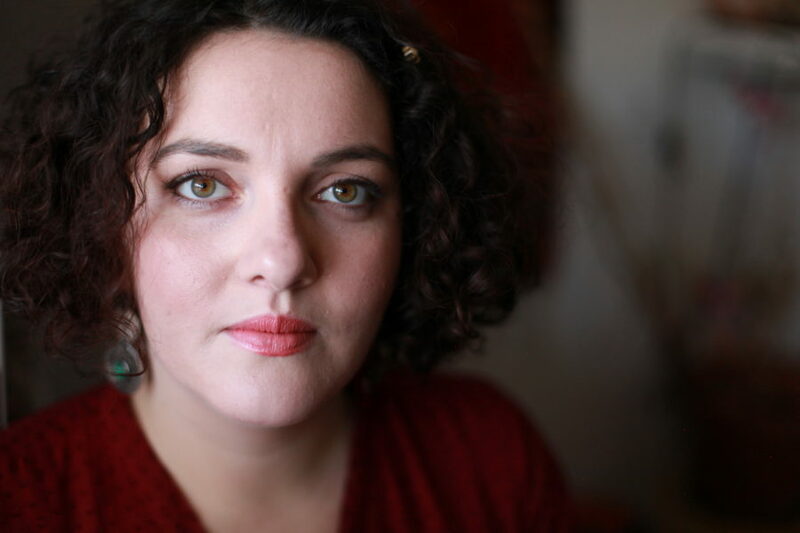 May Skaaf is a well known actress and creative artist who is known for her anti-Assad stance, and was detained a few times during the Syrian revolution. Skaaf was one of the very first actors who publicly joined the non-violent protests. As a result, she was detained by Syrian forces, and was eventually forced into hiding with other young Syrians, often without electricity or water. When the film Farewell to Damascus was shot, Skaaf was unable to leave the country, as the Syrian regime had imposed a travel ban on her. She was eventually able to escape Damascus, and hopes to return to a free Damascus sometime soon. Bab al-Hara, “The Neighbourhood’s Gate,” the smash hit Syrian soap opera, has returned to Arab television screens after a hiatus of three years during which civil war been ravaging the country. Bab Al-Hara was originally aired during Ramadan, and has become part of the emerging modern tradition of the Ramadan soap opera. Many Arab satellite channels broadcast special programming every night during Ramadan in an attempt to capture audiences from among the families who have gathered together to eat and break the fast. 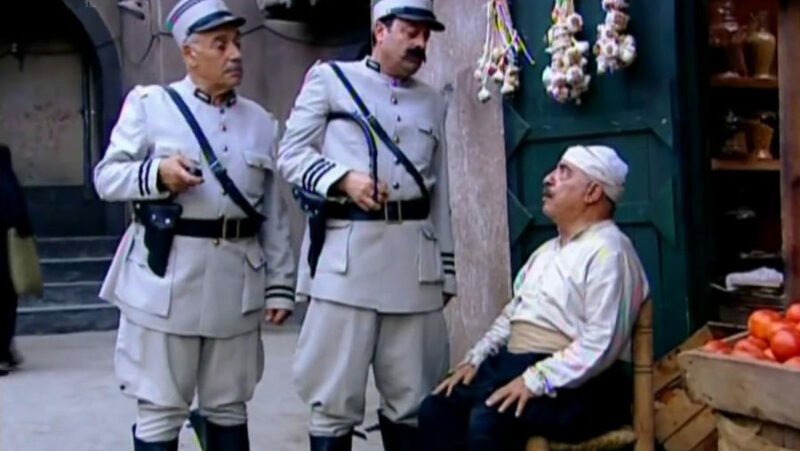 The series focuses on life in old Damascus during the French mandate, and it is being shown not only in Syria, but also Lebanon, Egypt and other countries. In its heyday, the show had 50 million viewers. Yet its return, plagued by changes in set, producer and director, reveals how the Syrian film industry has suffered over the past few years. This year, the number of Syrian-produced soap operas plummeted to 20, almost half the number produced in 2010. But as the government regains its grip on power, Syrian soap operas have largely followed suit. Historical dramas are still popular, but are now infused with the official line. 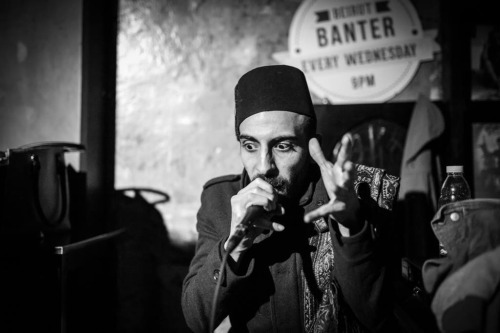 Usually seen donning an old-school tarboush, MC Assasi, co-founder of the group Bilad El Sham, aims to combine contemporary hip hop with the music of a bygone era. Bilad El Sham infuses hip hop with riffs from retro Arabic classics as well as Algerian Rai music to create a pan-Arab musical movement. Founded in 2006 in a studio in Yarmouk refugee camp in Damscus, Refugees of Rap is comprised of four members from Algeria, Syria, and Palestine. Refugees of Rap’s first self-titled album dropped in 2007 and discusses political and social issues of everyday life for Palestinians & Syrians inside Syria. According to Al Moniter, Refugees of Rap’s 2007 song “Palestine and the Decision” was downloaded by over half a million people. In 2010, the band released their second album, “Face to Face.” In 2011 the group began recording songs sympathetic to the Syrian revolution which resulted in their studio in Yarmouk being ransacked. The group has since relocated to Europe where it continues to record music and tour. Aleppan artist Samer “Zimo” Saem Eldahr’s Hello Psychaleppo is one of the Middle East’s most eclectic, creative, and aesthetically on-point indie musical projects. Collaging together samples of Oum Kulthoum, Abdel Halim Hafez and other classical Arabic music giants of the 50s and 60s with a manic, edgy psychedelically-inspired electro, Zimo creates a truly postmodern Arabic sound. His disjointed, restless, and yet soothingly familiar sound represent the longing-filled life of a Syrian displaced from a homeland, a homeland that will one day need to be creatively pieced back together. Wondering how best to get involved as someone interested in political activism at home, in Syria, or beyond? So are we. Still. Always. But here are the links to three organizations we think might be a good starting place. CultureLink is a settlement organization that is both old and new. They have over 25 years’ experience in developing and delivering settlement services to meet the needs of diverse communities. Passionate about providing innovative services to newcomers, they adapt to changes and create new programs that best respond to and address their clients’ specific needs. Their team of 50 staff members, speaking more than 30 languages, is dedicated, knowledgeable, and multicultural. Their services connect cultures to build welcoming communities. They assist newcomers looking for employment, help families navigate the school system, and provide newcomer youth with the skills necessary for bright and successful futures. They support refugees and bring together new and established Canadians. In everything they do, they are committed to embracing differences and linking the new with the old. The Canadian Council for Refugees is a national non-profit umbrella organization committed to the rights and protection of refugees and other vulnerable migrants in Canada and around the world and to the settlement of refugees and immigrants in Canada. The membership is made up of organizations involved in the settlement, sponsorship and protection of refugees and immigrants. The Council serves the networking, information-exchange and advocacy needs of its membership.